It is this contradictory and complicated engagement with the metropolis that seems to fascinate all the contributors to this collection. New York City, as it exists in film, here represents an entity impossible to pin down. While it is more than just a cinematic backdrop, more than a mere location, its exact characteristics and its place in film and culture become highly contested. By the end of this anthology of New York stories, I was left with the sense that the city – and the films which emerge from and about it – can mean almost anything to almost anyone, and that this is the reason for its continuing hold on our filmic imaginations. This is a diverse collection of essays, looking at everything from Woody Allen’s films of the 1970s – such as Annie Hall (1977) and Manhattan (1979) – to “class-passing” in films from the 1930s, such as Dinner at Eight (George Cukor, 1933), My Man Godfrey (Gregory La Cava, 1936) and Manhattan Melodrama (W.S. Van Dyke, 1934). We jump from the architecture of Alfred Hitchcock’s Rear Window (1954), North By Northwest (1959) and The Wrong Man (1956) to Martin Scorsese’s portraits of the streets in Who’s That Knocking at My Door (1967), Mean Streets (1973) and Gangs of New York (2002). And from Spike Lee’s explorations of racism in Joe’s Bed-Stuy Barbershop: We Cut Heads (1983) and Do the Right Thing (1989), we are thrown into the ethnic slums of Street Scene (King Vidor, 1931) and Dead End (William Wyler, 1937). All these elements are tied together by a thread of exuberance about the diverse and ever-changing nature of the city, a deep love and nostalgia for New York and all the things it represents, and an embracing of all the ways the city has been represented. In this way, City That Never Sleeps seems to fulfill Murray Pomerance’s intention as articulated in his introduction, where he describes the collection as “something of a rhapsody and also something of a meditation” (p. 4): “the city configured here is a kind of dream and not exactly a place, an inspiration and not exactly a polis” (p. 5). As a kind of “map” for the book, Pomerance’s introduction describes a number of ways in which this particular city has been rendered on screen, seeing it as everything from an actual location to an imaginary part of cultural memory, from a spirit which can be transplanted elsewhere to an asylum for anyone who doesn’t fit in anywhere else. 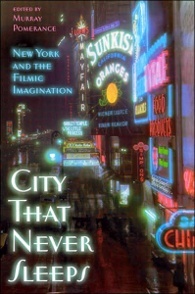 While suggesting that this city, and this city in film, can ultimately mean anything and cannot be truly fixed or theorised, Pomerance also acknowledges that the sections of the book are like New York’s neighborhoods, each bounded by limitations, and he admits that many important films had to be excluded. By accepting the impossibility of creating a definitive vision of New York, the authors are allowed free reign to project whatever they like onto this screen city. Each author seems to see this metropolis from a very specific, often limited, perspective. Yet the variety of positions taken, and films discussed, allows for a reasonably comprehensive series of snapshots – each one illuminating another side of the city and the films which take it as their inspiration. Pomerance cites William Rothman’s The “I” of the Camera (1) in laying down the ground rules for the nature of these meditations, and this makes for a refreshing work of film theory. There is a genuine commitment here to textual analysis over “a dominating precinematic reality” (p. 5), and a discussion of the particular pleasures and experiences associated with the cinematic city. Beginning his introduction with Jean Baudrillard’s assertion that “you should not…begin with the city and move inwards to the screen; you should begin with the screen and move outwards to the city” (2), Pomerance argues for a discussion of the city as represented on the screen and experienced through cinema, and for an understanding of New York which cannot be separated from the way it is represented in our particular filmic imaginations. Barry Keith Grant writes of his memories of “growing up simultaneously in New York and with the movies” (p. 49), of an experience of the city which cannot be separated from the movie theatres and the films he saw there, especially The Beast from 20,000 Fathoms (Eugène Lourié, 1953). This cannot help but recall Woody Allen’s deeply nostalgic Radio Days (1987), in which the city and the movies are deeply interconnected, and it highlights the personal angle taken by many of the contributors in their discussions of the city they idealise. Manhattan is not seen exclusively as an idyllic, iconic metropolis, however, but rather as a place, or a personality, which both attracts and repels, brings together and tears apart. In a long tradition of ambivalence towards the urban jungle, the essays here do not present a uniformly positive representation of the city that never sleeps. In an analysis of Breakfast At Tiffany’s (Blake Edwards, 1961), Peter Lehman and William Luhr end their discussion of the chic and bohemian Manhattan with a sad realisation that the impulse to alleviate the alienation and loneliness of modern life often fails. New York, despite its glamour, is seen in an ambiguous and not altogether positive light. Balancing out discussions of upper-class sophistication and endless possibilities – in films like Swing Time (George Stevens, 1936) and The Philadelphia Story (George Cukor, 1940) – the city’s darker representations are given equal weight. Films filled with police corruption, brutality, ruthless capitalism and violence are discussed by Pamela Grace in her chapter on Sidney Lumet’s 12 Angry Men (1957), The Pawnbroker (1964), Q & A (1990) and Serpico (1973); films which portray the city as a site where any of our darker thoughts and fascinations can be given a home (if not a rent-controlled apartment). This collection certainly highlights contradiction and difference over cohesion and uniformity, and it stresses film’s power to capture, and inform, these inconsistencies. A book about New York on screen would not be complete without frequent reference to Woody Allen (at least, the Woody from the late 1970s) and Martin Scorsese (at least, when he was making gritty films about the darker side of urban life). The contributions from William Rothman and Paula J. Massood on these directors are some of the most interesting in the book. Rothman takes an unusually sceptical view of Allen’s work – especially the oft-praised The Purple Rose of Cairo (1985) – accusing him of an inability to move on from tired and nostalgic notions of his city and suggesting that the films in which Allen does not play the romantic lead are sadly lacking in “soul’”. He berates Allen for not acknowledging his debt to classical Hollywood films, and sees Annie Hall as a “remarriage comedy” in the tradition of The Philadelphia Story, albeit one that fails due to Alvy Singer’s inadequacies compared to Cary Grant’s Dex. He sees Allen’s films as being ultimately concerned with his characters’ failure to find happiness in the metropolis, although it seems that – given the deeply contradictory image of the city that begins to form as we get further into the book – this failure of love in the city is part of the allure and the excitement so eagerly sought by the characters in New York films. Rothman ends with a somewhat disappointing aside: in a book so concerned with analysis of filmic texts, it is strange that Rothman finds hope in Allen’s decision to make films in London. He mentions Match Point (2005) and Scoop (2006), but admits he has not seen either film. If he had, he might not have been so keen for Woody to give up on New York, and might have found these new films sadly lacking in the qualities which made Allen’s New York films so successful (3). Massood, in her discussion of Scorsese’s New York, again takes up the theme of contradiction in representations of the city, seeing it “as both utopian and dystopian – a place of family, tradition, and group identity that is also limiting and insular and where any form of border crossing is often life-threatening” (p. 77). This description of the city allows for another of the book’s themes to emerge – the idea that films about New York are both specific to their location and representative of broader issues in America as a whole. Themes of inclusion and exclusion, isolation and belonging, possibility for social mobility and a debilitating tribalism, seem to emerge time and again in these essays, whether they are discussing films from the 1930s or more recent renditions of a city much changed by globalisation, migration, and, of course, terrorism. With essays as diverse as the city itself, and a vast variety of films analysed in relation to complex and conflicting readings of this ultimate urban landscape, City That Never Sleeps offers a varied and rich work of the filmic imagination. The book’s focus on the films themselves is commendable, and it insists we interrogate the way images of the city affect and change our experience of it. We encounter the “nightmare imagery” of Escape from New York (John Carpenter, 1981) (p. 124), and the city as satanic in Rosemary’s Baby (Roman Polanski, 1968), alongside analyses of Manhattan’s architecture and its links to class issues. From the city as ethnic slum to the city as a motivating character in filmic narratives, New York is not a fixed entity or idea. It is nostalgic, serious and delirious. It is specific, yet mutable. It is, as Pomerance points out, “the New York of our screen dreams” (p. 4). City That Never Sleeps: New York and the Filmic Imagination, edited by Murray Pomerance, Rutgers University Press, Piscataway, 2007. William Rothman, The “I” of the Camera: Essays in Film Criticism, History, and Aesthetics, second edition, Cambridge Studies in Film, Cambridge University Press, Cambridge, 2004. Pomerance takes Richard A. Blake’s reading of Baudrillard – from his book Street Smart: The New York of Lumet, Allen, Scorsese, and Lee – as the opening for his introduction to City That Never Sleeps (Richard A. Blake, Street Smart: The New York of Lumet, Allen, Scorsese, and Lee, University Press of Kentucky, Lexington, 2005). Pomerance qualifies this by saying Baudrillard will not “inhabit” the book (p. 3), but he explains that the notion he articulates with this quote will be of great importance for the whole project – the idea of travelling from the screen to the city, and not the other way around. This is certainly the case with Cassandra’s Dream (Allen, 2007) – an unsuccessful attempt to make another Crimes and Misdemeanors (1989) – where working-class British lads struggle unconvincingly with the words of a Manhattanite. Anna Knight is a PhD candidate in the School of Culture and Communication at the University of Melbourne. Her research focuses on Woody Allen’s relationship to the city, walking, and memory.